Poor Donald Trump! Not only is the millionaire (is he still? Are we keeping track?) and disgraced racist being roundly mocked in the media for his presidential campaign, but now Harvard has gotten into the act, jokingly endorsing The Donald for president in a fake ad. Trump is, sadly, less than pleased. According to Salon, the ad was just another in a long-running series of practical jokes between The Lampoon (Harvard’s humor publication) and The Crimson (Harvard’s very important school newspaper which this one dude I know who went to Harvard read religiously), which have a good-natured rivalry with each other. The staff of The Lampoon took a picture with Trump at Trump Tower in New York earlier this summer. 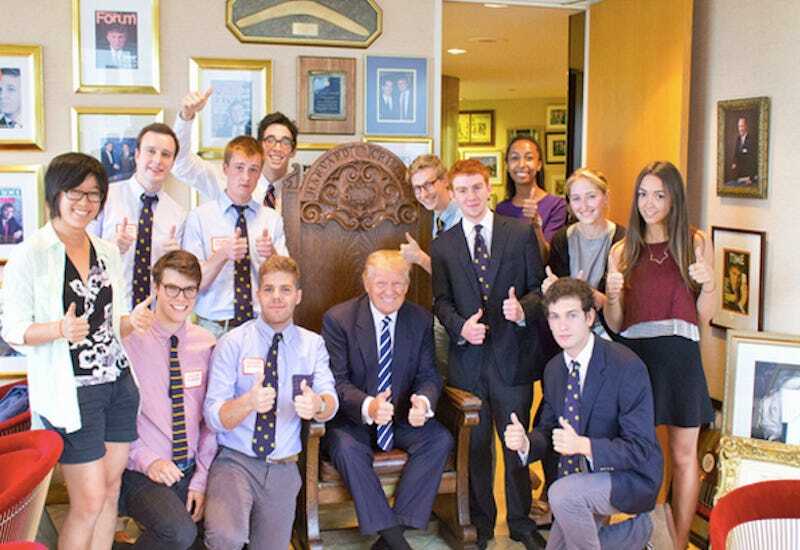 The photo depicts our future president sitting in the chair belonging to The Crimson’s president (stolen) and was used as a graphic for a fake website The Lampoon put up to try and convince people that The Crimson endorses Trump for president. If this all sounds kind of tedious, it certainly is. Personally, I’d prefer it if Clickhole ran a Donald quote and he fell for that, but you take what you can get. And the endorsement’s pretty funny, in a “thank god Rory chose Yale” sort of way. After contacting The Crimson and learning that they had nothing to do with the site, one of Trump’s campaign spokespeople referred to the staff of The Lampoon (who unironically refer to themselves as “’poonsters”) as “liars and fraudsters” and said that the photo took only a few moments’ time out of Trump’s day (which is usually planned to the second with racist and sexist remarks and an hour-long siesta during which Trump rests by screaming “you’re fired” at a mirror to remember the days when he had a successful reality show that once starred Omarosa). “Mr. Trump attended the great Wharton School of Finance, a school that has more important things to do,” the spokesperson wrote in a statement, effectively dropping Wharton’s application rates by 50 percent. If nothing else, this “scandal” should remind the American voting public that Trump is a humorless monster who can’t poke fun at himself and takes everything as a personal attack. If Trump is elected president, then I’m predicting we’ll be at war during his entire term. Trump isn’t the first to fall for such a prank. Salon reports that Scott Walker also became the victim of some merry pranksters when they asked him to pose with a giant check for $900 million written by the Koch brothers. The Crimson’s president’s chair has been returned.